The Flora found in the Elder Scrolls series are wildly varied, from real world plants such as aloe vera, to the alien flora of Oblivion. Flora and fungi (see below) are listed alphabetically on each of the sub-articles listed above. This page serves to explain the guidelines we use to determine what is included in those articles, it also contains some information on flora in general. 1 What Qualifies as Flora? Apples, while delicious, do not qualify as they are only a plant product. Since The Elder Scrolls series has a large number of plants and plant life material there has been some minor controversy cataloging them. This is due to the fact that we do not use the proper definition of flora, and the lack of books or texts on the subject. For the purpose of simplicity, some guidelines have to exist. It must either be plant life or fungi. The inclusion of both is for simplicity so we don't have nearly two identical groups of pages. Fauna do not qualify. It is named. There are many nameless plants in Tamriel and Oblivion, and trying to list those would be pointless due to a lack of knowledge about them. Please note that this does not mean plants mentioned in other sources such as books qualify, it still must meet the other guidelines. It is backed by a plant, as in something like an apple does not qualify. We are listing plants, not their products. This means that certain things are excluded, even though logically they must come from somewhere. This is because we simply have no way of knowing where that somewhere is. This also excludes all ingredients from Daggerfall. Flora and fungi mentioned in books only qualify if they meet all guidelines. Books, such as Special Flora of Tamriel can also be used to meet the other guidelines as in the case of ironwood. 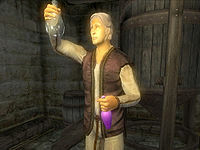 The primary use of flora in Tamriel is for harvesting alchemical supplies, or for subsistence. Alchemists rely heavily upon the abundance of floral ingredients, with few alternative sources of supplies. Farms and gardens are often cultivated in order to provide resources for both civilization and alchemical practitioners. Generally only certain plants useful for sustenance are grown at farms, such as wheat grain, while other plants, such as the poisonous nightshade, are used exclusively in alchemy and tend to be found only in gardens or growing wild. Alchemical gardens, however, often grow a much wider variety of flora and fungi than farms do in order to accommodate the many possible varieties of potions and poisons. It is also worth noting that many plants are used as decoration, domesticated solely for their appearances. Many public gardens can be found throughout Tamriel's cities, and many private residences tend to plants. Generally flora and fungi can be found everywhere, from the depths of the sea to the planes of Oblivion. Plant life perseveres nearly everywhere one can travel to. 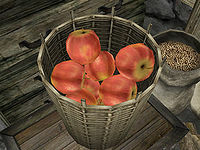 Many farms and gardens can be found that raise a large number of domesticated flora, such as the corn stalk, throughout all of Tamriel. Travel through forests, wastelands, and the frozen north and you will discover many types of flora thriving in these locations. The abundance of plant life in nearly all environments has lead plenty of variety to be found that have adapted to their environment, such as the nirnroot and sacred lotus, which in the wild only grows near water. Bloodgrass is able to survive in the inhospitable landscape of Mehrunes Dagon's Deadlands, demonstrating the ability for flora to thrive where life is all but impossible. Alchemical gardens that tend to mages needs can often be found in their towers and guild halls. Many plants, such as morning glory, are used as decoration, and can be found decorating public gardens, city walls and walkways. This page was last modified on 3 December 2017, at 02:21.